The Industrial Revolution left many New England cities and towns with a legacy: manufacturing pollution that turned once-productive, and often pristine, land and water into dumps. This practice of contaminating natural resources and then leaving behind scarred remains, after the offending business went bankrupt or left for greener pastures, continued well into the 20th century. The result: By the end of the 1980s, thousands of brownfields dotted the southern New England landscape, especially in its core urban areas. Remediating brownfields is a constant battle that pits public health and environmental concerns against cost factors. Clean-up efforts are often interrupted by hidden obstacles, such as underground storage tanks filled with waste oil, and finding the responsible party to pay the price is virtually impossible. A brownfield, according to the Environmental Protection Agency (EPA), is an abandoned or underutilized industrial/commercial facility where redevelopment is complicated by real or perceived environmental contamination. And these derelict and damaged properties represent do-overs — at least that’s how the EPA sees it. “We view these sites as opportunities,” said Frank Gardner, EPA brownfields coordinator for Region 1. “Every brownfield site is an opportunity. We provide funding to actively clean up these properties, to make them safer for the public and for economic development." In the past few years, southern New England has been the beneficiary of considerable EPA funding to help remediate brownfields. In fiscal 2014, for example, the EPA distributed a total of $67 million to all 50 states for such projects — Rhode Island received $2.1 million, Massachusetts $5.9 million and Connecticut $5.3 million. Brownfield remediation projects, on average, leverage $17 per EPA dollar expended, according to Gardner. He also said the federal agency’s Brownfields Program creates additional benefits, such as increasing residential property values near remediated sites by 5 percent to 12 percent, and empowering states, communities and other stakeholders to work together to prevent, assess, safely clean up and reuse brownfields. The EPA notes that since the program’s inception in 1995 it has leveraged 90,363 jobs nationwide. But transforming blighted brownfields into community assets is no easy task. It takes money — plenty of it — patience, often a public-private partnership and some creative thinking. One Massachusetts program, for example, encourages ground-mounted solar projects on brownfields and landfills. On a contaminated brownfield near two schools, the city of New Bedford got inventive and contracted with Con Edison Solutions and BlueWave Capital to build a solar project. This solar installation is intended to be used to help support energy education and encourage students to consider working in the renewable-energy industry. Successfully overhauling such properties also depends largely on a site’s contamination level, according to Cynthia Gianfrancesco, who runs the Rhode Island Department of Environmental Management’s (DEM) Targeted Brownfields Assessment Program. The program began in 1996 as a pilot in communities, such as Providence, North Smithfield and Woonsocket, with long histories of manufacturing and heavy industry. Those centuries of incineration, smelting, metal plating, concrete manufacturing, etching and electroplating contaminated much of southern New England’s land and water. But a number of private and/or public projects has breathed new life into long-abused properties. 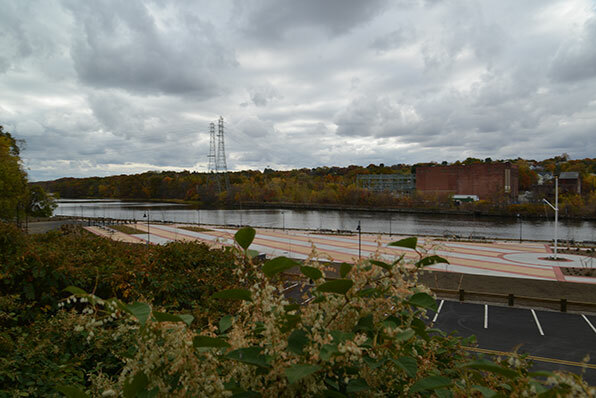 Since 1994, the EPA Brownfields Program has awarded Rhode Island $34.8 million, Massachusetts $106.3 million and Connecticut $71.8 million to fund a three-state total of 1,422 remediation projects. That 20-year total of $212.9 million helped clean up 301 properties in Rhode Island, 783 in Massachusetts and 338 in Connecticut, but it represents just a slice of the money that was needed to advance those projects. And those 1,422 brownfield remediation projects the EPA has helped fund since 1994 represent just a fraction of the southern New England sites plagued by contaminated soil, polluted waters and abandoned properties rife with toxic waste, such as asbestos and lead. Little Rhody, for instance, has some 10,000 to 12,000 brownfield sites, according to best estimates. But the number of properties in southern New England contaminated by the region’s industrial past is slowly declining. A once heavily polluted property, the Steel Yard is now a Providence attraction. From locomotive manufacturers to steel mills, Providence has a long history of industrialization. While the city’s manufacturing industry gave rise to an economic boom in the late 19th and early 20th centuries, few operating mills remain today. It was with a slight tip of the hat to those industries that made Providence economically great that the Steel Yard was founded in 2002. The visionaries who started the nonprofit artists collective also wanted to acknowledge the legacy of environmental degradation that heavy manufacturing has had on the city and state’s natural resources. The Steel Yard is in the city’s Olneyville neighborhood, a once flourishing industrial enclave for textile, jewelry and metal manufacturers. A dozen years ago, the site was closed and in disrepair. For years, Providence Steel had sprayed its finished girders with lead-based paint, with the overspray leaving high concentrations of lead in the property’s soil. The cost to transform this 3.5-acre brownfield on Sims Avenue into a community asset was substantial. The eight-year remediation project cost nearly a million dollars, and was completed thanks to federal and state grants, fundraising efforts, and donated materials and labor. Today, the old Providence Steel buildings have been converted into more than 9,000 square feet of workspaces for artists, and classrooms for education and job training in the industrial arts. The property has become a signature city attraction. The Steel Yard, however, isn’t the only Providence brownfield to enjoy an expensive makeover. Two Octobers ago, community members, neighbors and representatives from Groundwork Providence gathered to celebrate the completion of the Hope Tree Nursery, in an industrial area on the city’s West Side that once housed metal manufacturers. Situated on the former Sprague Industries site, a brownfield still laden with residual toxics from its factory days — no soil can be removed, so the trees are grown in pots — Hope Tree Nursery now provides the Elmwood neighborhood access to affordable trees grown locally. The nursery’s physical presence also has improved the look and feel of Sprague Street. Two distressed areas along the Woonasquatucket River have been revitalized and turned into community assets. Riverside Park, a former brownfield and high-crime area, is now a 6-acre neighborhood oasis. Its redevelopment brought with it a bike path, new housing and the opening of small grocery store, and crime has fallen sharply. Contamination from the former Lincoln Lace and Braid factory — petroleum, metals and volatile organic compounds (VOCs) — had spread to this industrial river. It cost $991,000 — funded by state and federal money — to cealn up the property, which is now a passive greenspace connected via a bike path to other urban parks. WaterFire Providence will soon make its new home on a three-parcel site on Valley Street once occupied by a rubber manufacturer and machine shop. The ongoing renovation includes a stormwater management system. The property also will be used as an incubator for artists and businesses, and will host after-school programs. A 25-acre site on the Providence/Johnston line and bordered by the Woonasquatucket River, had been contaminated by lead and arsenic, until the early 2000s, when the Button Hole Golf Course opened. Today, the nine-hole course is a teaching center that brings golf to urban youth. The city’s neighbor to the north, Pawtucket, another community with a rich industrial history, recently announced that renovations to the Festival Pier waterfront park off School Street will be completed at the end of November. The park is expected to open to the public Dec. 1. When finished, the $2 million brownfield remediation of the Old State Pier property, a former oil terminal along the Seekonk River and home to the popular Chinese Dragon Boat Races, will feature a new plaza, lighting, benches, a canoe/kayak launching area and a boat ramp. Mosaico, a nonprofit community development corporation, has owned the the former National India Rubber Co. on Wood Street in Bristol for four years. Prior to that, the brownfield was in receivership, several buildings were in disrepair and there were outstanding DEM violations tagged to the 14-acre former Kaiser Mill Complex. During its heyday, this industrial complex employed more than 1,200 people, and local families set their clocks to the mixture of solids, liquid particulates and gases belched from its smokestack at 7 a.m., noon and 5 p.m.
Mosaico applied for and received Targeted Brownfields Assessment Program funding from DEM to complete an environmental assessment of the property. The nonprofit then applied for and received a $200,000 EPA brownfields grant. The money is being used to clean up contamination, address stormwater management requirements and cap portions of the site with new landscaping. Mosaico is seeking additional funding to complete improvements on the remainder of the site, which would allow for increased occupancy and economic development opportunities. About 60 percent of the space is occupied by some 25 companies, which range from boat builders to sign and skateboard makers. This popular waterfront town also features two other ambitious brownfield redevelopment projects — Thames Street Landing and Premier Thread. Thames Street Landing was empty for three years before this redevelopment project began in 1999, on property originally used as a lumberyard. Most of the site’s contamination — lead, arsenic, petroleum and polycyclic aromatic hydrocarbons (PAHs) — resulted from production of coal, coke and lumber in the last 40 years of the 1800s. Some 20,000 yards of contaminated soil was removed from the 2.2-acre site, and the entire project cost $8.3 million, most of it privately funded. This waterfront property now features retail establishments, a restaurant, offices, apartments and a hotel, transforming a once highly contaminated, abandoned lot into a central part of the town’s economic and social structure. The Thames Street site of the former Premier Thread factory and old Narragansett Electric manufactured gas plant is now high-end condominiums. This project, Owens said, also helped stimulate neighborhood development.